Sell your Gold in Houston to Houston Gold Buyers. Just minutes from the Galleria, at 1330 Westheimer Rd #3 Houston, Tx 77006. Front door parking, easy access. Pull right up, walk right in!! Top Dollar Paid for Your Gold, Silver, Platinum, Large & Fancy Colored Diamonds, Bullion, Silver Flatware, Rolex Watches, Luxury Watches, Broken Jewelry, Class Rings, Unwanted Gold Jewelry, U.S. Gold Coins, and of course your rare Coin Collections. We will travel to your home or bank to appraise your coin or watch collections. Convenient front door parking, just park and walk right in. Just minutes from the Galleria in the heart of Houston. The owner specializes in large diamonds, fancy colored diamonds. At Houston Gold Buyers we always are here to buy gold and sell gold in Houston. Houston Gold buyers we pride ourselves on paying the most in the city of Houston for your unwanted gold, silver, and platinum jewelry, large and fancy colored diamonds, gold and silver coins, Rolex and other luxury watches, gold and silver bullion, coin collections, & silver flatware. We will appraise your gold, jewelry, diamonds, coins, Rolex watches or silver flatware free of charge. Immediate Cash payments for your items. Located just minutes from the Galleria, at 1330 Westheimer Rd. we have been serving the Houston Area since 1993. Drive right up to our front door and walk right in. No walking through a parking garage or large parking lot with your valuable items. Have a large coin or watch collection? We will come to your bank or home for a free appraisal and offer. Never has there been a better opportunity to cash in on today’s rising costs. Gold is at a record high and has no sign of slowing down. Why trust a mailed envelope or someone doing business at a hotel? We test and appraise your items in front of you unlike when you mail it out. Our process is 100% transparent. Have a question on how we calculate your offer just ask. We are not a fly by night gold buyer. We have been serving Houston and surrounding areas since 1993. Don’t let the name fool you, we are not just buyers. At Houston Gold Buyers we also have an amazing collection of gold and silver U.S. coins, Rolex & other luxury watches, fine jewelry, & rare U.S. currency for sale. Looking for an item to add to your collection. Give us a call at 713-521-2160 to see if we have it. If we do not currently have the item you are looking for we will make every attempt to find it for you. Why should you spend your time trying to locate a rare item for your collection? Let the professionals at Houston Gold Buyers do it for you. We do not JUST buy gold. We buy precious metals in any form including silver, platinum, and palladium. We are always trading bullion daily. From Bags of 90% Silver, Gold & Silver American Eagles, or generic 1 oz silver rounds. We will also buy Broken Gold Jewelry, Used Gold Jewelry, Estate Jewelry, U.S.Gold and U.S. Silver Coins. We also buy foreign gold and silver coin collections, single coins, and rare currency. 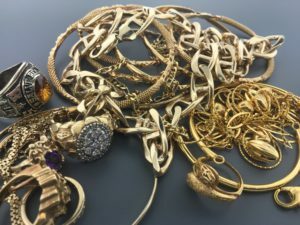 If you have a box full of sterling silver jewelry or it is just taking up space in a drawer, bring it by and we will pay you top dollar for your scrap silver jewelry. Sell your silver today! Call us today about getting the highest price for your diamonds, gold, sterling silver or platinum jewelry, scrap rings, bracelets, chains, earrings, coins, castings and other precious metals you want to turn into CASH! We even buy Rolex watches new and used and other fine watches in any condition such as Cartier, Breitling, Panerai, and many others. Bring your timepiece by along with your gold or silver items and used jewelry for a free no obligation offer. Sell your Rolex watch for the highest price paid in Houston. We are located in the Heart of Houston, 1330 Westheimer Rd 77006. Minutes away from the galleria! Our large convenient parking lot allows you to pull right up to our front door and walk right in with no lines, no hassles. 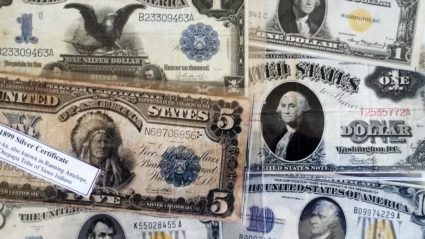 We also buy Currency including but not limited to Individual Rarities, National Currency, Small Size Notes, Large Size notes, Error Notes, Proofs, Gold Certificates, Confederate Notes, and Texas Currency. We are Texas’ Top Buyer of $500.00 $1,000.00 $5,000.00 and $10,000.00 Notes. We are always buying Sterling Silver flatware sets, serving pieces, and serving sets. We also buy Silver flatware for special patterns, and Antique value like Francis I, Buccellati, Rose Point, and a few others. We are your buy gold Houston headquarters.